Anatomy Month: the start of a tradition? As I am currently very busy finishing some publications, I have had little time for new research the past few months – hence my relative silence here. Therefore I’d like to draw attention to a series of events that I enjoyed very much and which I believe deserves to become a yearly occurrence: the first-ever Dutch Anatomy Month. Skeletons affected by disease. Source: Museum Vrolik. Two weeks ago, I was invited to give a talk during an anatomy weekend at Museum Vrolik in Amsterdam. Organized by the curators of anatomical collections in the Netherlands and Morbid Anatomy‘s Joanna Ebenstein, the weekend was one of the highlights of the month. It included a morning of talks on various aspects of the history of anatomy, as well as exciting workshops like a mini wax-modelling course by artist Eleanor Crook, an expert in forensic facial reconstruction. With exhibitions and events in museums in Leiden, Amsterdam, Utrecht, and Groningen, Anatomy Month shows the enormous diversity of anatomical collections and the importance of anatomical knowledge past, present and future. Anatomy, whether it human, animal, normal or pathological, was and is about learning about ourselves, about the structures of our bodies. We all have an anatomy – I think that that is one of the reasons why books, events and exhibitions about anatomy are so universally appealing. Amazing Models in Museum Boerhaave. Photo: Koen Hauser. Hair and make-up: Louise van Huisstede. Model: Georgina Verbaan. Design: BrandendZant. 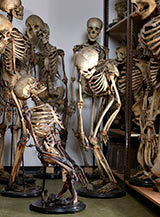 The events and exhibitions during Anatomy Month are certainly appealing, and there is something for every age group. In Groningen, the University Museum has created a special exhibition of anatomical preparations in the Aa church to celebrate the four hundredth anniversary of the university, an in Museum Boerhaave in Leiden the alluring exhibition Amazing Models, featuring wax, textile, wood, plastic and papier-mâché anatomical models is on display until the end of the month. In Utrecht, the exhibition Tot op het bot (to the bone) focuses on skeletons, with live demonstrations by a taxidermist, special tours, lectures, and a hands-on bone puzzle for the youngest visitors. Finally, on 1 June, the anatomical museum at the Leiden University Medical Center (LUMC) is open to the public – a great opportunity to learn more about their impressive historical and contemporary collections, as this is only one of the two annual days the museum is open to all. Unlike some (historical) exhibitions concentrating on human anatomy, the one on display during Anatomy Month share one common denominator: they are all not only fascinating, but also respectful. If you are not in the Netherlands but love the history of medicine as much as I do, I hope this is an inspiration. Wouldn’t it be great if May became Anatomy Month all over the world?